There was no Week in Review last week. This week's post includes items from last week and this week. 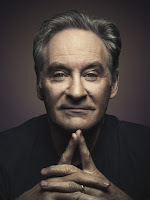 Broadway—The great stage and screen veteran and two-time Tony Award winner Kevin Kline will return to Broadway this spring in a revival of Noel Coward's Present Laughter! The play was last seen on Broadway in 2010. Deadline reports that the revival, which will be a limited engagement, will open on April 5, and will take up residency at the St. James Theatre, one of Broadway's largest venues. Tony nomineeMoritz von Stuelpnagel (Hand to God) will direct. Stravinsky Violin Concerto: Principal dancers Sterling Hyltin and Rebecca Krohn are so well-suited to this. Their long, sinewy limbs make particularly sharp and powerful angles, which is what this ballet is about. It's not about looking as graceful as possible; it's about exploring your joints and the ways you cam move. Hyltin's pas de deux with Robert Fairchild is more contentious than the Krohn-Amar Ramasar duet. You can hear it in the music, the violin sounds more violent, like it's being played with more verve. I like the moment in the final movement when Fairchild and Ramasar dance together—they look like brothers having a blast. Such a great score; a fabulous representation of what can happen when you stick to the basics. Good music, simple costumes (i.e., none), and deliberate choreography. I always like classic with a twist, a break from the tutu ballets. The Emmys were handed out on Sunday, September 18, in a ceremony hosted by Jimmy Kimmel. Herein, winners in select categories. 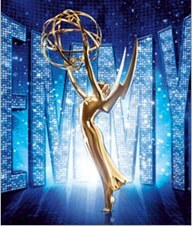 Visit emmys.org for the full list of winners. I had never heard of gospel stars Sister Rosetta Tharpe or Marie Knight, and I'm not a churchgoer, but damn it if Kecia Lewis (Rosetta) and Rebecca Naomi Jones (Marie) aren't providing a magical, religious experience in George Brant's play with (lots of) music, Marie and Rosetta. 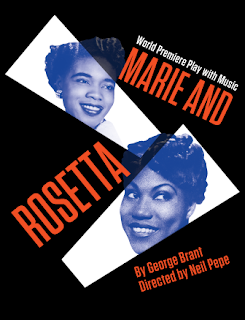 Set in 1946 Mississippi, Marie and Rosetta, directed by Neil Pepe, lets us in the room where Marie, a 23-year-old aspiring singer, comes under the tutelage and becomes a colleague of established gospel singer, Sister Rosetta. As the two women get to know each other and groove to the soul-shaking music we get treated to two vocal powerhouses raising the roof. Aaron Tveit (Next to Normal, Brain Dead) will star alongside Edy Ganem in the legal drama, Created Equal, now in production in New Orleans. The movie focuses on a woman (Ganem) who wants to become a Catholic priest and the lawyer (Tveit) who's fighting for her. Variety has more. Tony nomineeChristopher Fitzgerald (Waitress) is joining the cast of the upcoming Netflix series, Godless. Fitzgerald joins Jeff Daniels, Merritt Wever, and others. BroadwayWorld.com has more. Additional casting for Hairspray Live has been announced. Ephraim Sykes (Hamilton) will appear as Seaweed, and Shahadi Wright Joseph (School of Rock) will play Little Inez. The live telecast will air on NBC on December 7. Playbill has more. Jonathan Cake has joined the cast of The Affair for its third season, and will appear in a recurring role. The season premiere is set for November 20. TV Line has more.